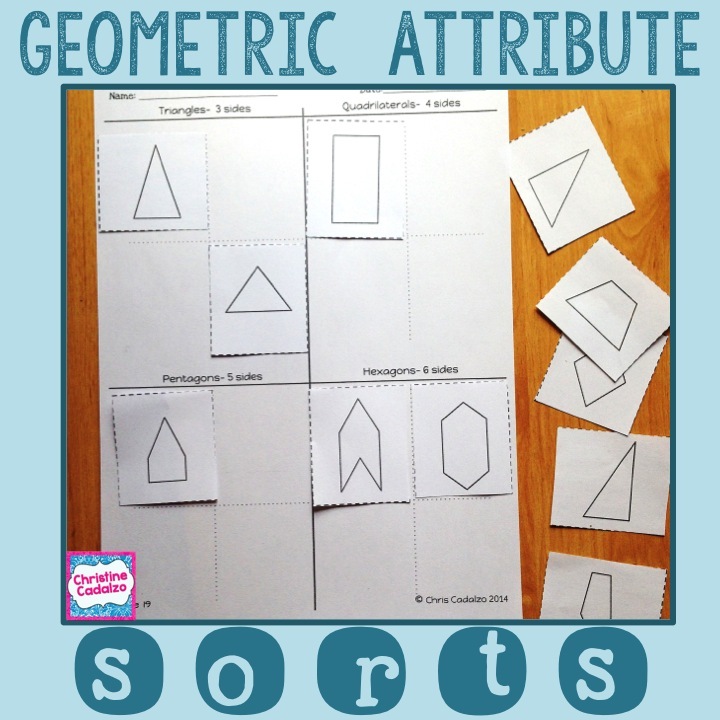 What is a Geometry Sort? A geometry sort is when students are classifying shapes into categories based on the geometric attributes of those shapes. 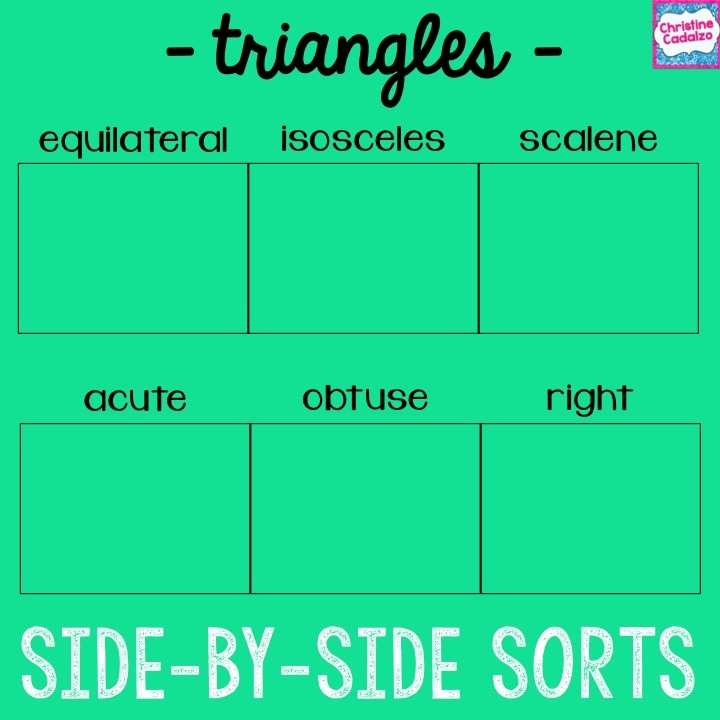 -Geometry sorts help students focus on the identifying geometric attributes (number of sides, parallel lines, angle sizes), as opposed to other attributes such as color, orientation, and shape size. -Geometric attribute sorts help students look for and notice patterns among shapes with a common attribute. They may notice that all rectangles also have two sets of parallel sides, for example. -Sorts challenge and push student thinking about classifying shapes. Does a square go in the “rectangle” or “not a rectangle” category? Challenging thinking like this helps students expand their understanding of what a rectangle is, and helps them see squares as a subset of rectangles, rather than a separate category. It helps them see that not all rectangles look a certain way. 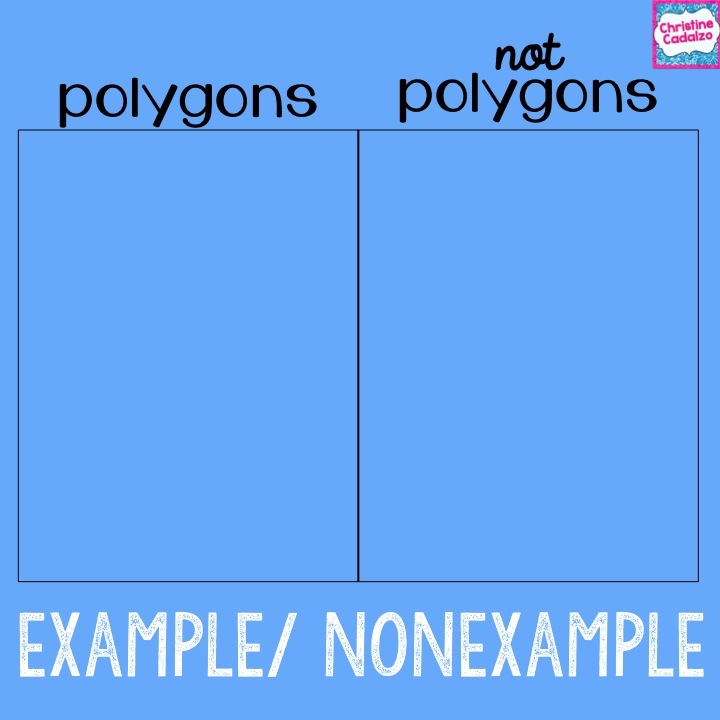 -Once students have classified the shapes into categories, they can draw additional shapes that fit each category. This pushes their thinking about geometric attributes even further. Students classify shapes into two categories. The shape either has the geometric attribute or it doesn’t. Students classify shapes in to two or more mutually exclusive categories. Each shape can only fit into one category based on its geometric attributes. Students classify the same set of shapes into two different sets of categories, so they can compare and contrast the two different classifications. Students classify shapes onto a Venn Diagram so they can see the geometric attributes they have in common. 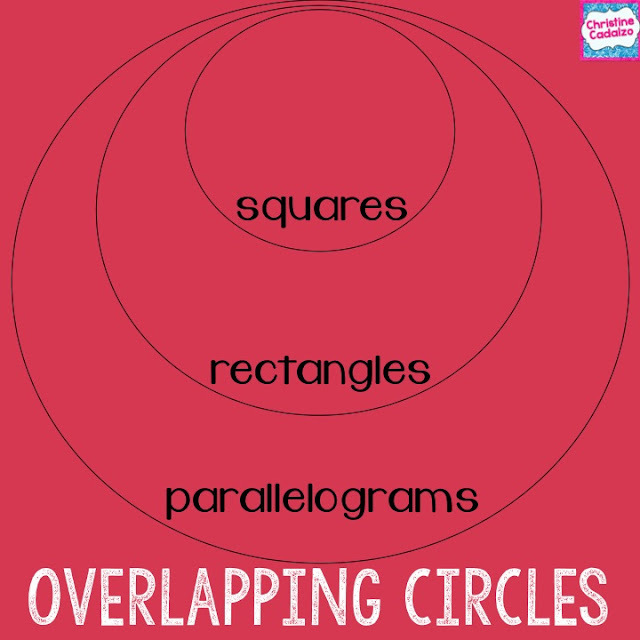 Students classify shapes into overlapping circles. The largest circle represents the largest category of attributes (e.g., polygons), and the smallest circle represents the smallest/ most specific category of geometric attributes (e.g., squares). This way of classifying is more complex because students have to consider subgroups and the hierarchy of attributes. -What geometric attribute makes this a ____ ? -How do you decide how to classify a shape? -Why did you put this shape in this category? -How could you change this shape so it would go in a different category? 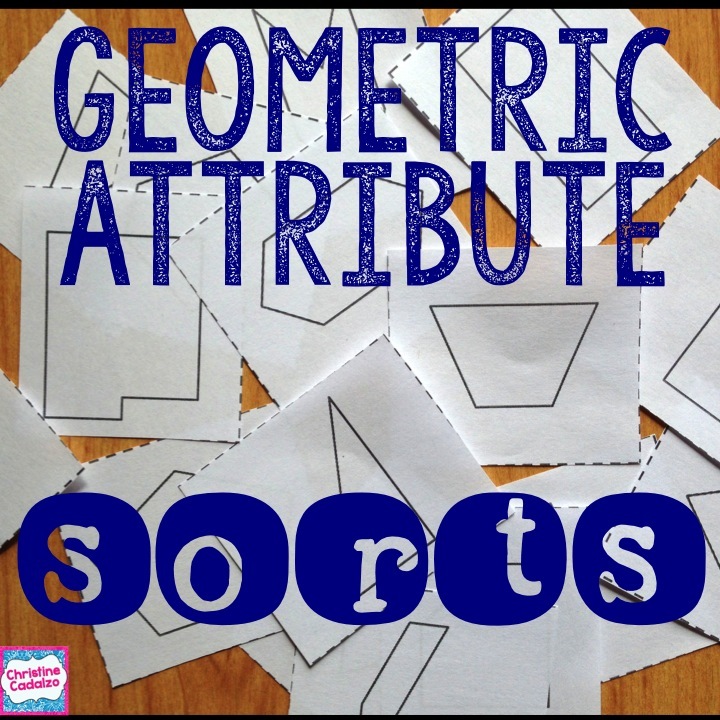 -What geometric attribute do all the shapes in this category have in common? Do they also have anything else in common? -What would you call this shape? Why? Could you call it anything else? -What geometric attribute would a shape need to be in this category? -Are there any geometric attributes that would keep a shape OUT of this category? -How are ___ and ___ related? 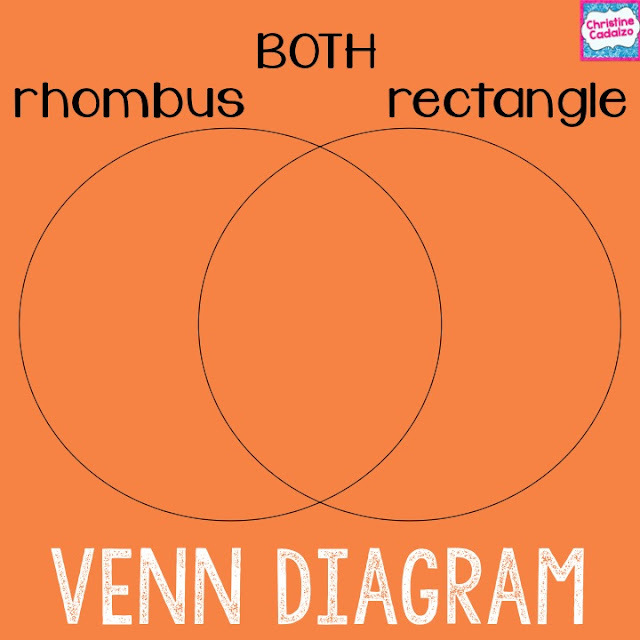 -Do the shapes in these two different categories have any geometric attributes in common? Are these subcategories of a bigger category? 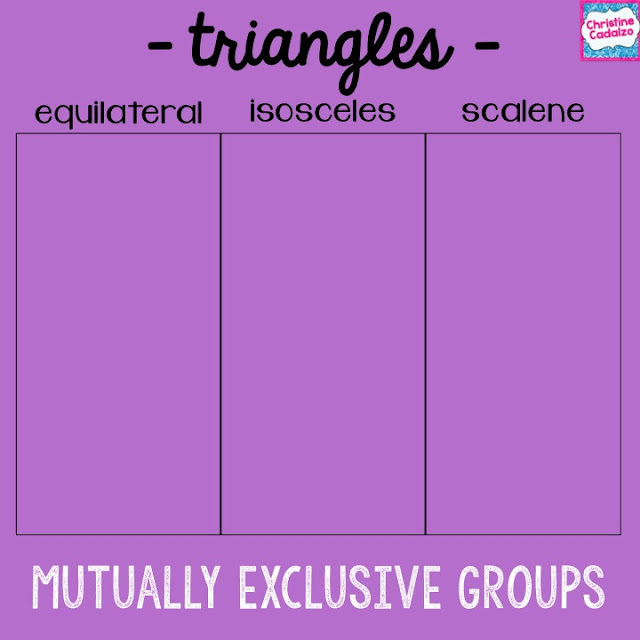 PS: Looking for some pre-made, Common Core- aligned sorts, lessons, and activities? 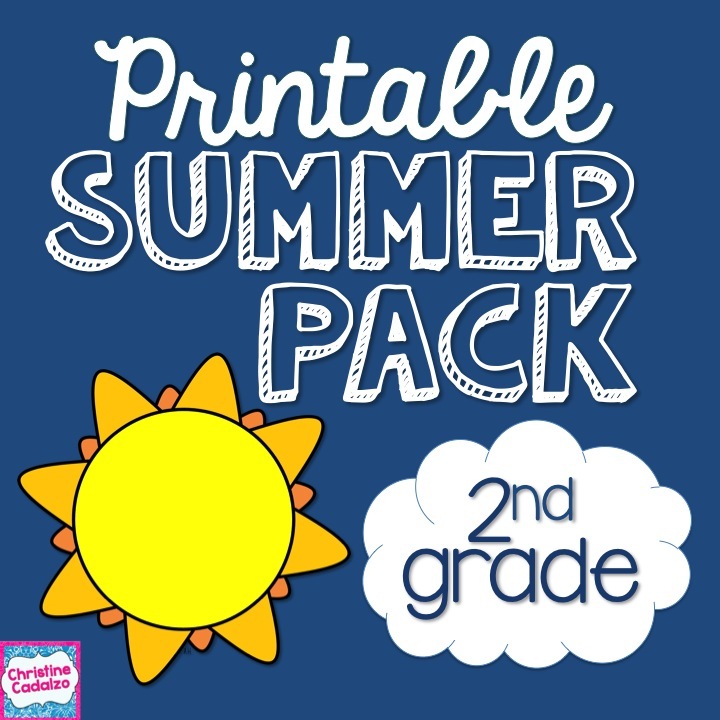 Get a printable copy list FREE by clicking here. Tired of your students making the same computation errors over and over?!! 1. Look for patterns. Sometimes, kids are making the same kind of mistake over and over because of a misconception. (Maybe they are subtracting 0-9 and writing '9' or aren't correctly borrowing across zeros.) Once they understand why they are making that mistake and what to do when they encounter similar situations, they will usually stop making that error after a bit of practice. 2. Model making mistakes and reward the students who spot the error and correct you. The key is to do this without telling them. When we tell kids to look for the mistakes, they usually can find them. We need to help them transition to noticing errors when they aren't specifically attending to them. 3. 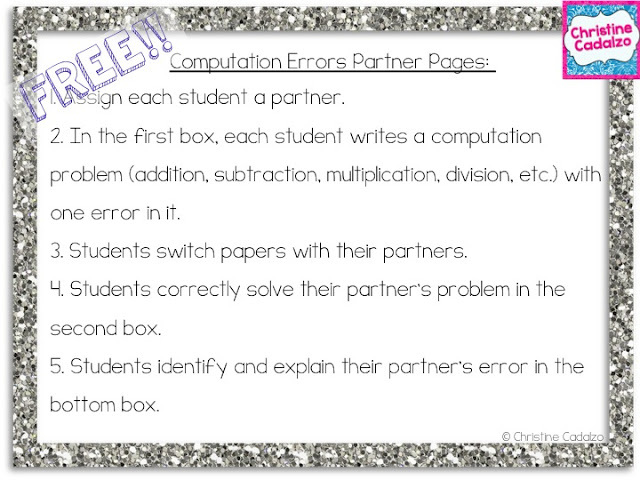 Try this FREE partner activity. Students write a computation problem with an intentional error. Then, they switch papers and work to find the error. It's fun, simple, and can be used with any kind of computation. 4. 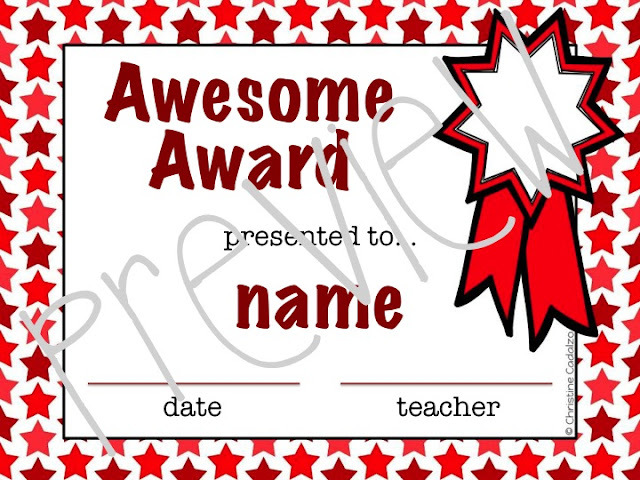 Reward accuracy, and reward students who find and correct their own errors. 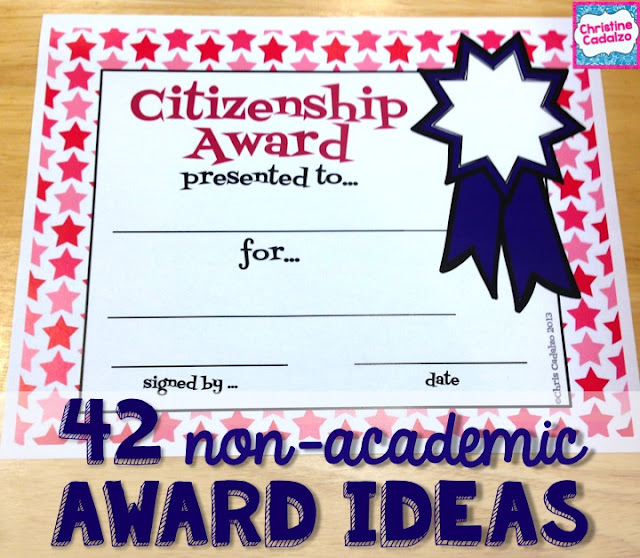 Make a big deal out of it, so your class knows that these things are super important. It's important to work carefully and to check your work for mistakes. Teach them that accuracy is important and valuable. 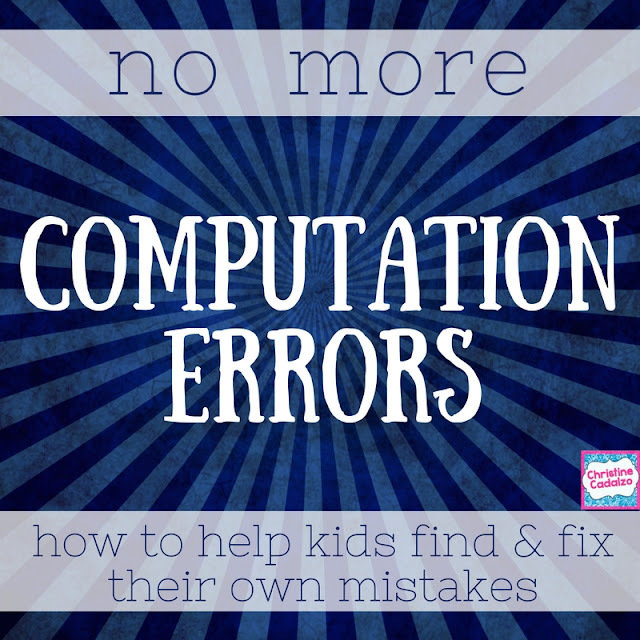 This will help with the motivation to work accurately and correct their own errors, but you'll still need to make sure that they have the skills to be able to do that. 5. Make sure students understand the reasoning behind the algorithm, and aren't just blindly following the steps. Students are much less likely to make errors if they understand WHY they are carrying the 1 or WHY they need to put a 0 somewhere. Working with base 10 blocks for addition and subtraction, and with arrays and groups for multiplication and division will help students understand the method behind the madness. Encourage them to use multiple strategies, visual models, equations, benchmarks, estimation, and to explain and justify their responses. It's all about helping kids make sense of what computation means. For more resources, check out these addition and subtraction lessons. Array flash cards are just like regular flash cards that have the regular "times table" on one side and the product or "answer" on the back. The difference is that array cards also have an array showing the factors as rows and columns. So, an array card for 5 x 9 has a rectangle with 5 rows of 9, or 45 total squares. The product 45 is on the back. 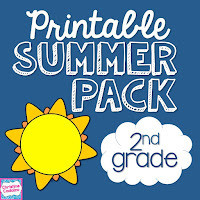 You can make your own, have the kids make them, or save time and get them here. 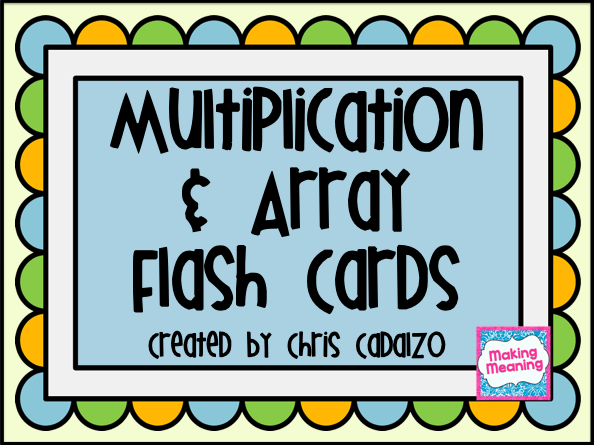 Why use array cards instead of regular flash cards? - The rows and columns provide the critical link between repeated addition and multiplication. 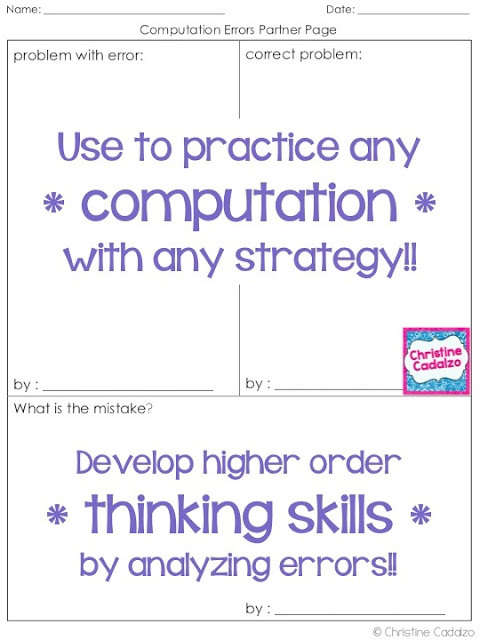 - They allow for flexible thinking and multiple strategies. Using a 5x3 array, students can count by 5s or by 3s. Or, they can find 5x2 and add one more 5. - Arrays help students visualize the Commutative Property and see why 4 x 8 has the same product as 8 x 4. 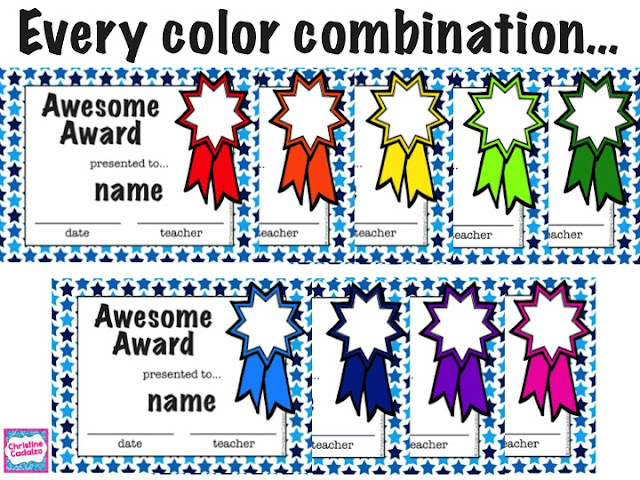 - They provide support for learning both basic and more complex multiplication facts. Once students understand repeated addition, single digit multiplication, and the Commutative Property, arrays can be used to model multi-digit factors and the Distributive Property as well. 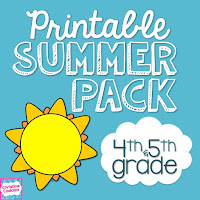 - In an array, the product is basically the area of the rectangle, which helps students connect geometry and number operations. -I give each student two quart-size plastic baggies, each with their name on it. One is labeled "Facts I Know" and the other is "Facts to Practice." -They also get a complete set of flash cards with the arrays on one side and the products on the back. I like to use bright-colored paper to mitigate the potential of them getting lost. -Once each week, we partner up and quiz each other. 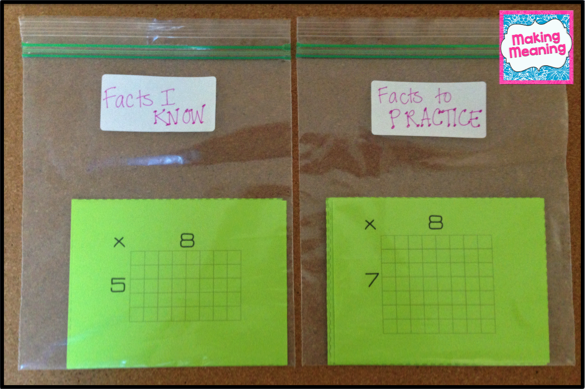 If a students gets the fact correct in five seconds or less (I figure, when we get to multi-digit multiplication, 5 seconds is about the time it takes for them to lost their place because they spent too long figuring out the math fact), they put a pencil check mark on it and put it in the "Facts I Know" baggie (which stays in their desk). If they get it wrong or can't get it in time, they erase any previous checks on it and put it in the "Facts to Practice" baggie (which goes home every night for at least 5 minutes of practice). -I like to rotate the partners each week so that the quizzing is as consistent and fair as possible. -If some students finish quizzing each other early, they can use that time to help each other study their facts or play one of the array games listed below. -Once a card has 3 checks on it (meaning the student has gotten it right for 3 weeks in a row), it goes in the recycling bin. We have a corny little ceremony at the end of our weekly partner quizzes- someone comes around with the bin and everyone sings, "Na-na na-na, na-na na-na, hey, hey, GOODBYE!" as they toss in their learned facts. I have no clue how it started, but it's a tradition now. Good luck! For more (FREE!) 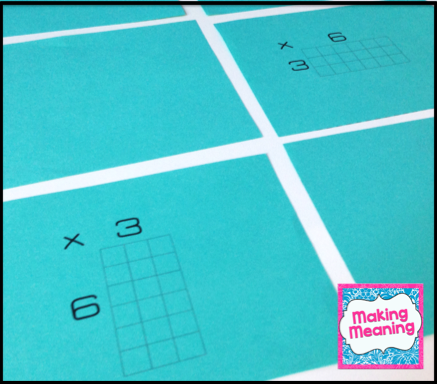 ideas, follow the Making Multiplication Meaningful Pinterest board! Did you know that kids can lose 2-3 months of learning over the summer? No one wants to start the new school year already behind!! Use plastic tubes, things that float/ sink, pool noodles, food coloring, droppers, squirt guns, ice... use your imagination while learning about the properties of water! Anything. Get some "trash" and start upcycling. Be creative and use your engineering skills! 3. Play online learning games. Online games are especially great for building basic skills (math facts, spelling, etc.). But they can also be really good tools for building problem solving, resourcefulness, creativity, imagination, logic, and spatial skills (think of games where there's a 'map' that you have to keep in your head- like The Legend of Zelda). 4. Cook or bake something. Adults need to try new things, too!! Go to the market and pick up a new fruit or vegetable, then try it in a recipe! Following recipes helps kids with measurement and fractions. Try halving or doubling the recipe for an extra challenge. Practice measuring liquids by making fun new drinks (1 cup of cranberry juice and 1 cup of seltzer water, eg.). Kids need beach reads too. Even grown-ups don't want to read "War and Peace" at the beach or park. We want something lighter and a little easier to read. The same goes for kids! Just because it's not a challenging chapter book doesn't mean it's not valuable. There's a ton of great vocabulary, inspiration, and even challenging themes to be found in today's picture books. Pinterest has tons of great art ideas for kids. See what you have lying around the house, and get creative!! Or try making works 'in the style of' your favorite artists. (Or just make a mess, that's cool, too.) Pro tip: This is also a great way to clean out your closets and get rid of some things! Turn them into DIY or art projects. Let kids organize one of their desk drawers, part of their closet, a shelf in the cabinet, anything! This is not only an important life skill, but develops important skills like categorizing and ordering. 8. Invent a new game. Gather a bunch of random objects to be your game pieces. Decide what the objective of the game is. Make up some rules. Adjust it as you go to make it easier or harder. Play and have FUN! There are a million things to talk about!! What do you think about... ? What would happen if...? Would you rather ... or ...? If ... happened right now, what would you do? If you could go/ meet/ see/ etc. anywhere/ anyone/ anything/ etc. in the world.... ? Bonus points for starting a conversation with a stranger or with someone who just needs a friend to talk to. There's a lot of research out there that shows how good going somewhere new is for our brains. It expands our horizons (pretty much literally!) and helps us form new pathways in our brains. We may actually even burn more calories when we go for a walk somewhere we've never been, instead of taking our same old route. Go to a new park, museum, a different library or grocery store, take a different way home, take a day trip, go visit someone, whatever you can. Just go! I hope you have a wonderful summer, filled with love, laughter, and LEARNING! 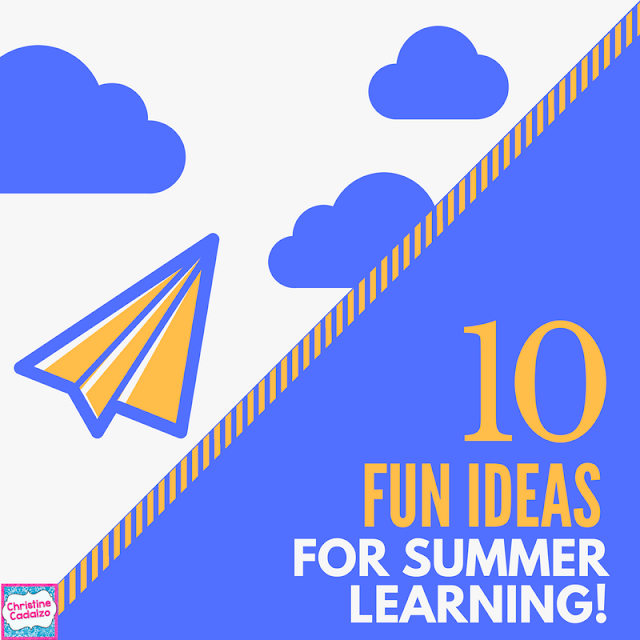 And, for TONS more ideas, check out this Summer Learning Pinterest board! 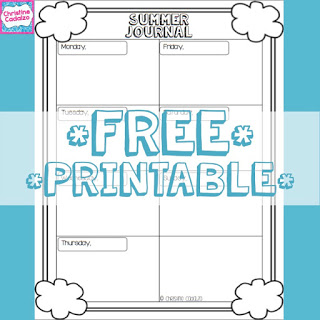 PS: If you need a FREE journal page to keep track of all your summer fun, you can get it here!